Scrangie: Sephora By OPI Swatches! So the UPS man just surprised me with a box of nail polish from Sephora! I didn't even get a tracking number, they just mysteriously showed up! Hooray, another pleasant surprise! Cab Fare. I love the color- a bright yellow with yellow-gold shimmer, like Orly Live Wire but not as bright. However... This polish was extremely thick and impossible to work with. See how thick it looks on my nails? That's two coats and it's uneven and lumpy. This was even, dare I say, stringy? Call Your Mother. Oooh, I like this. Another muted purple. I'm happy that these colors are appearing more often. They're very unusual and I find that exciting! Charge It! If you don't want to spend $30 on Chanel Gold Fiction, get this! It's not an exact match but the finish is the same. It's a bright, shiny, metallic, polished gold. Love this. Domestic Goddess. Bright purple creme, woot!! Don't Go There. Brighter than Call Your Mother, but I don't like it quite as much. It just doesn't do anything for me. Pretty, but meh. Metro Chic. Another one of these weird colors! I love 'em! Quite similar to You Don't Know Jacques, and I'm perfectly fine with that. Never Enough Shoes. Not exactly what I was expecting. I had expected more obvious glitter, but this is actually really subtle. I can see red, gold and silver glitter, but it's super-tiny microglitter. I was hoping for something like Petites Black Star. Run With It. WOO! This is wicked cool! I think they should have named it 'wet cement' because that's what it looks like. It's a muted light grey with the tiniest tinge of red, it looks like. It has a fine shimmer running through it that gives the appearance of concrete- all those little sparkly crushed stones. I really, really love this. A lot. I hope this isn't limited edition! Truthfully, I wasn't impressed by the quality of these. The main problem I had is that every creme shade I bought has ribbons of unmixed pigment running through it. I normally don't have a problem with this, a little shaking is enough to take care of it most of the time. But, even after a moderate amount of shaking, the ribbons were still there, and worse, created pigmented streaks on the nail! Formula-wise, about half were good and half were a horrible, thick, gooey, streaky mess. The brushes are nice, a nicely shaped standard nail polish brush, no Pro-Wides here. I am not a fan of the bottles for three reasons: One, they look like they'll be insanely hard to open if a little bit of polish dries in the threads. Two, they look cheap. And three, they look more like something you'd find in an, um, adult store than a bottle of nail polish. I'm happy with all the colors I ordered, even if they weren't exactly what I was expecting. I have to say, while some of these are pretty, I am not a fan of Sephora in general. It seems like the polishes are a cheapened version of OPI, and not worth the bucks. Thanks for saving me some cash! nit tii bad,..but if the app. is bad i think ill just by YDKJ..but i want the charge it (that is the gold right,,?) what was the app. like on that?? has any one tried Amour colour effects??? comments?? Is there a three hour time delay with your postings? Because I don't know how else you swatched all of those so fast! Amazing! I agree, the bottles are *suggestive*. Who comes up with this stuff?! thanks!!! i would love a swatch or two of them ONLY WHEN U HAVE TIME (these are not in high demand! lol) but i read on one of your older posts on where to get stuff...(transdesign or sumthing) its amazing except i cant even find out how much it costs for shipping per lb until i give all the information but im not ready to order i jhust want prices!!! do u order from there enough to give me an apprx. guess?? Scrange, I am exactly the same way with the word "pumpkin"! Brainiac = a disappointment. Glad I didn't order it! Some of these look pretty, but overall I'm kind of unimpressed. I understand some of Sephora's clientèle may want pretty pinks, reds, and purples, but I wish there were more edgier colors. So how does Cab Fare compare to Solar Power by China Glaze. I already have Solar Power, but I really want Cab Fare. And thanks for the swatches! These don't really do anything for me. The one thing I don't get is why they cost more than normal OPIs...because they're Sephora OPIs?? Not sure. Although some of the colours seem interesting (I wanted to buy a bottle of Metro Chic but they were all sold out) they're not colours I'd go crazy over. Nice swatches though, as usual! oh thank you thank you thank you...i cannot wait till i get the $$$ to order... hey scrangie how do you like the nicoles...you dont talk much about them and they are (other thne the shorts coll...a couple SH.. and that revlonn gold one) the only other polishes i have right now!! it's up to you..change the world..the right thing..respect the world..one voice..blue lace..virtuos violet..razzledazzler..their all soo beautifull especially as collection starters! !my friends cant get enough of them i think ill have to start charging for the usage..seriously :-S... which ones do you love ?!?! I LOVE some of these. But I think I'm going to hold off on placing an order - and you're right about the bottle shape they're hideous and cheap looking. Scrangie, damn, you are absolutely amazing! Thank you so much for the best swatches out there. And don't get me started on your fanny as hell and *unbiased* comments. Thank you, thank you! PS: Somebody should send Suzi a pumpkin. Poor thing apparently cannot afford one to look at the color! Claire, Solar Power is more muted and the shimmer seems more silvery. Cab Fare is bright like lemons and has golden yellow shimmer- cousins but not twins :) Solar Power's formula is waaaay better! Thank you, Karman! I am very surprised they didn't do anything "exclusive"- you can find 99% of these colors anywhere, but they expect people to pay $9 for these cause they say "Sephora"?? But, the formula and color selection pretty good! To DIE FOR swatches Scrangie! Thank you for your awesome commentary on these. It is saving me from even being interested in them. The first time I saw those bottles I was like, "This is obscene!" Glad I'm not the only one with a dirty mind. But the polishes are rockin'! get hot with nubar vs. new york summer! Danielle, it's just that I have these nail polish racks that I like to keep my polish on, and the Nicole bottles don't fit, I have to put them in sideways, lol. Could you be a doll and compare Don't Go There with RBL Purple Haze? I'm wearing Purple Haze now and they look similar (although NOT like exact dupes). You are the greatest. Thanks dear! I don't have any taupe-y grey colors, and I'd prefer a taupe creme. Did you like one of those colors better than another by any chance?? Great swatches Scrangie! How did Call Your Mother apply? It looks a little thick on your nails. I hate having to deal with gloopy polish. Thanks. Great stuff, Scrangie! A small request - can you think of any dupes of 'Run With It'? I love that shimmery, concretey dove grey, but I'm in Australia and order all of my polishes online. OPI costs AUD$20 in the stores over here; it's just not worth it to buy nail polish in bricks and mortar! Also, I'm all over the Misa Poisoned Passion collection but none of my e-tailer usual suspects have it. Where did you get it, and please tell me they ship overseas! You make my heart ache for polish loveliness and my wallet hurt from the lemmings, Ms Scrangie! Asia12mb, you're right- it was a bit thick! It was one of the more chunky ones, but I added a little thinner to it today and it seems okay so far! Rach, hmmm... I can't think of any exact dupes, but perhaps China Glaze Recycle with a few drops of white mixed in, and a little shimmery topcoat on top might be pretty close. Sorry I can't think of a better dupe =/ It's a pretty unique color! I think the collection was 'officially' released yesterday and I know that TransDesign.com has it (I think they ship overseas). The other etailers should have it soon and I know 8ty8 and Head2Toe ship overseas :) Thanks for the kind words! 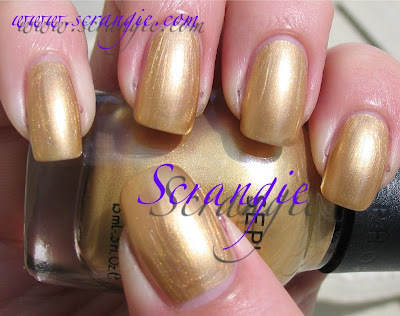 Scrangie's lackluster review of OPI by Sephora is no big shock considering this new polish is a completely different product than original OPI. I'm an industry insider and I have it from the best of people that only the 3 letters in the name (O, P and I) are the same. It's a completely different formula and it's produced by a different manufacturer than the salon OPI. Sounds like the quality is less (not that it was ever that good anyway) but the price is more - and it sounds like it's no good to me. Anonymous, thank you for that juicy little tidbit! It's definitely not anything like the OPI I'm used to, and now I see why! I don't think I'll be getting any more of these unless the color wows me. Thanks for your comment, I appreciate it! Thanks for the honest review. I can now take these off my list. I hate ribbons. I feel like I am not getting the full color. I slapped Run With It! on my nail yesterday at the mall and really like it! Being anti-$9-polish, trusting your funny commentaries, and reading that juicy insider tip regarding the not-OPI formula... it all makes me want to resist and *hope* someone gets this cement color worked into their line. *sigh* A girl can dream, can't she? Fauxfun, the color is awesome, I hope some other line releases a better one! I thinned my Run With It with a WHOLE 3ml of Seche Restore yesterday and it seems to have improved the polish. But, you shouldn't have to thin a $9 polish!! Your swatches (and nails) look lovely of course-as usual! I bought Cab Fare becuase i absolutely love the color. Unfortunately, the thickness of the polish drives me nuts. Do you think the consistency would be better if i added in a few drops of Seche - Restore? 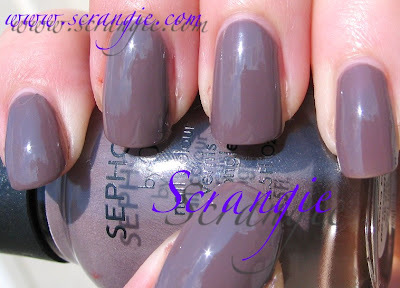 Anita, check out my latest post about Sephora by OPI- I added Seche Restore to all of them and they were much better! I was so upset by IM Beauty that I actually googled to see if others had the same problems. Streaky, AND despite using an OPI top coat (no Sephora OPI) it stained my nails a really hideous nicotine yellow.